• The fact of having special needs—whether disabilities or special gifts or talents—should not affect expectations for meeting the standards. 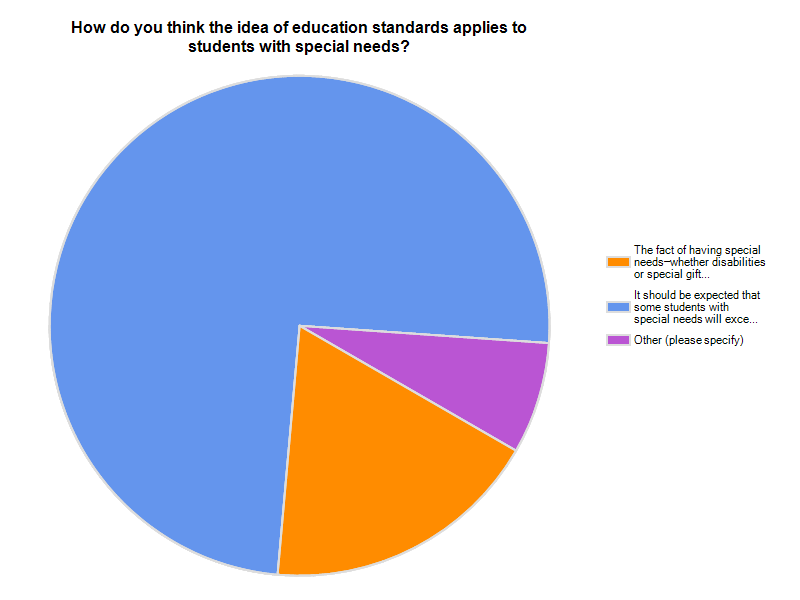 • It should be expected that some students with special needs will exceed the standards and some will fail to meet them. • Other (please specify) Either a lot of people were on vacation this month, or not as interested in the topic as in May and June, because there were far fewer replies. • 18.1% voted for the first response—that all students should be held to the standards. • 74.7% voted for the second response—that some gifted and special needs students would be expected to exceed or not meet the standards. 1. Instruction should be tailored to fit the specific needs of individual students. Standards should be specific to individual needs. 2. It truly depends on what is defined as ‘special needs’. Students should be expected to meet the standards set out, however, this does not mean that accommodations should not be made. 3. First, understanding that in order to qualify for special education, a student must fall a minimum of 2 years behind their classroom peers, requiring them to be tested using the same test as the classroom peers that they are already behind is simply a means of ostracizing and humiliating them even more – meaning the probability is higher that they will drop out of school. 4. The standards must be tailored to measure strengths that might be missed by the regular standards. 5. The answer is probably the second option. The reality is that our education system generally does a lousy job of meeting the needs of children with special needs and, from the view of a parent of child with special needs, the current education standards are pretty useless when it comes to helping these children learn. My child is almost 14 and reads at about a 3rd grade level. Her elementary school used 9 different reading curriculums in 4 years – all in the interest of meeting “standards”. She has her challenges but chasing standards have hindered her education and development at a huge personal cost to her and an enormous financial cost to me. 6. The fact of having special needs should not affect expectations for meeting the standards IF accommodations have been made for the student to be able to physically and mentally complete the work. The standards don’t change, but the methods of delivery change. Comments and suggestions for future survey topics welcome! This entry was posted in Uncategorized and tagged gifted and talented, national standards, special needs on July 30, 2010 by admin.